The Importance of Antagonistic Training for Climbers: A few simple exercises to stay injury free! Like everything on the planet our bodies strive to maintain equilibrium. Every thing needs to be even; in the correct balance, or things start to go wrong. All athletes who over use one area are prone to injuries. Climbers begin to get niggling injuries like elbow tendinitis (now called tendinopathy) due to an imbalance in their pull and push muscles. Nina has already written a fantastic article on Injury Management and Prevention for the elbows but I am keen to recap how just a few simple antagonistic exercises can significantly reduce your chances of getting these injuries. Nina, thank you for talking to Be Climbing, firstly can you please tell us just how susceptible climbers are to injuries such as elbow tendinitis (tendinopathy)? I would say elbow tendinopathies are very common. I sure see a lot of them! For those climbers that have got away with it so far, what are the tell tale signs that you are developing an imbalance? Unless you screen yourself it is hard to see the signs of imbalance before you get a problem. Some physiotherapists will offer a sport screening where they can assess injury risk factors and postural imbalances as a preventative measure. I’ve written about it and described some tests in my junior article on UKC. A general climbing postural imbalance is the rounded and turned in shoulders with large back muscles and no chest and front delts. The concave chest with a bulging back! Another sign of an imbalance is not feeling a stretch in one direction, but feeling a very strong stretch in the opposite direction. So for example, feeling really tense and tight, with your fingers not able to flatten out during a wrist and finger flexor stretch, but the opposite way, stretching your forearm/finger extensors you can go pretty much full range no problem. (Stretches are demonstrated in my finger and elbow articles on UKC). When coaching I emphasize the importance of maintaining a balanced muscle coverage through antagonistic training. In my experience most climbers have very tight forearms and rounded, hunched over shoulders and backs. I find the most simple and effective way to cure this imbalance is press ups and tricep dips to balance out back and biceps and use of Powerfingers to strengthen their wrist + finger extensors whilst stretching their forearms (wrist flexors). There are a number of antagonistic exercises out there but through years of training I have found that to encourage a client (or myself at that) to stick to a regular routine it has to be convenient and simple, therefore, these exercises are as basic and equipment free as possible. Dr. Volker Schoffl (German climbing team doctor) said he recommends Powerfingers to his clients as they work the finger extensors as well as wrist extensors unlike other extensor exercises like wrist curls etc. This testimonial confirmed my confidence in Powerfingers. Do you agree that in doing these 3 simple exercises after each training session, climbers can significantly reduce the chance of these injuries occurring? Yes I do. I preach much the same thing. I have recently started using and recommending Powerfingers to work on extensors after climbing instead of doing wrist curls, rice bucket and broomstick exercises as it works the same muscles whilst also stretching the flexors and I find it easy and convenient to do in front of the tele or in the pub! I have always been a fan of all kinds of pressing exercises to balance out the shoulders and elbows. The more varied type of pressing the better. You need pressing strength when climbing for mantle moves, and when press/pulling when climbing (pulling with one hand and pressing with the other), so this is a strength that will benefit your climbing, as well as help keep your muscles balanced front and back. Climbing predominantly involves pulling, so quite simply, it is good to do different types of pressing as well to keep the opposing muscles as strong. Tightening up pecs by doing pressing exercises will not make a Lat dominant posture more rounded, it will help correct the posture. 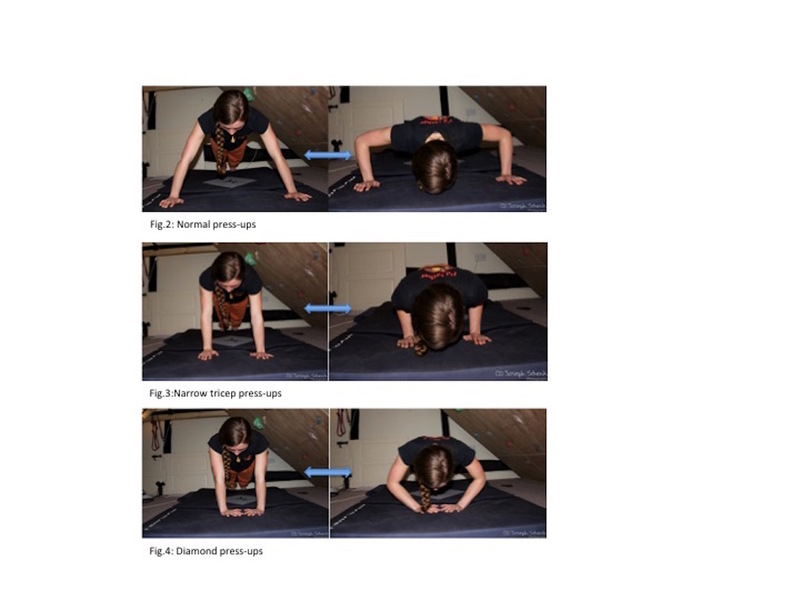 You need to stretch sport dominant muscles and strengthen the less dominant ones in a group like press ups vs pull-ups. A lot of pressing exercises are preformed in a position of wrist flexor stretching so you are stretching dominant muscles as well as strengthening, so added bonus! I use these same 3 antagonistic exercises with all my clients, however, the level of difficulty is adjusted to suit the individual’s needs. PFs range from easy light bands to hard resistant bands. Press-ups can easily be adapted for beginners on your knees to advanced on the rings or with raised legs etc. Tricep dips can be made easy on a box with some weigh resting on your feet to quite tricky free hanging between dip bars or rings. For those without a coach, can you recommend a way of calculating at what level we should be working at in order to even out this imbalance we are all in danger of developing? The easiest way to know if you are working at the right level of difficulty for you is paying attention to what you feel. You should feel the “burn”/”effort” in the appropriate muscles that are dominant in the exercise. For press ups its chest, triceps and center of torso/ tummy; for dips, its mainly triceps, shoulder blades and chest; for Powerfingers, it is the back of your fingers and top of forearm. You should not feel strain in places like your shoulders, lower back, or thumb (for PF). If you do, then you are either in the wrong position, or trying a level that is too difficult for you. You have to watch your form in a mirror, get a mate to video on your smart phone, or get a coach or therapist to tell you if you are in the correct position. Generally speaking you do not want to see upper or lower back sagging, shoulder blades “winging” or lifting off your rib cage, shoulders (front arm bone) poking out forwards, or for PF, you want to see your thumb in a fairly straight line (not kinked). You want to perform well most of the time throughout your set of reps. In order to push yourself however, you need to often go to failure to do so, which normally means losing form. This is acceptable for a few end reps, but NOT the full set x 3! The more robust your body is and the stronger you are in positions of good form, the more you can handle a bit of strain, so you can get away with a few reps of poor form, so to speak. However, if you are training bad form you are emphasizing bad form, which is asking for trouble at some point. Pushing yourself to failure and losing form for a few reps is fine, especially if you are robust and strong in different directions. Having a coach or a personal trainer is great as they can “spot” you when you are fatiguing and losing form to help you push through with out losing form too much. Also, please note that you can do most pressing exercises against a wall, kitchen counter or on steps of a staircase to make it easier than doing them on the floor. How many repetitions and sets are needed? The most important thing to remember is any antagonistic training is better than none but the more the better! 1-3 sets to fatigue of form is sufficient 1-3x week. Like I said above, you must read you’re body to work out if the intensity is correct for you. It also depends whether you are currently training endurance or power. A simple way to think of it is, however hard you are pulling, you need to push just as hard. If you are doing high volume endurance training you need to do a high volume of antagonistic training (low intensity, high rep). If you are doing high intensity power training (bouldering) your antagonistic training must mirror this by working low reps in a position that is very difficult for you, where you are challenged at 1-4 reps.
For press ups and dips generally speaking they are a gross motor exercises favoring more superficial muscles, so you generally see people prescribing reps and sets of 8-12 reps, 3 sets. However, you can train for endurance by just choosing a position that is easier (kneeling or wall press ups) and do loads of them. PF are training your wrist and finger extensors which are generally endurance muscles so I suggest training them to a pump within a minute to 5 min of constant work. You can do 3- 5 sets. You could however, use a difficult band and get a pump at 6-8 sec and repeat 3-5 x to train a bit more power. Your muscles are adaptable so you can train them how you want! So, if you want to push your bouldering then train them for power for a little while. When you have a trip coming up where you are doing more routes then train them for endurance. Another way to train endurance, which can be applied to all these exercises, is to change the speed of contraction within your set of reps. You can start your reps slow and controlled, then fast, then fast up, slowly down, and/or the reverse. This will help recruit as many muscle fibers as possible, train your muscles to recruit in different ways necessary for climbing, and keeps it interesting! Stretching is the other thing that climbers should be doing to even out this imbalance, this is not the focal area of this article but still very important; what stretches should climbers do to supplement this antagonistic training? Conveniently whilst doing the press-ups and using Powerfingers with correct form you are already stretching the forearms (wrist flexors). However, climbers should also regularly stretch their lats, rotator cuff, upper back and torso. 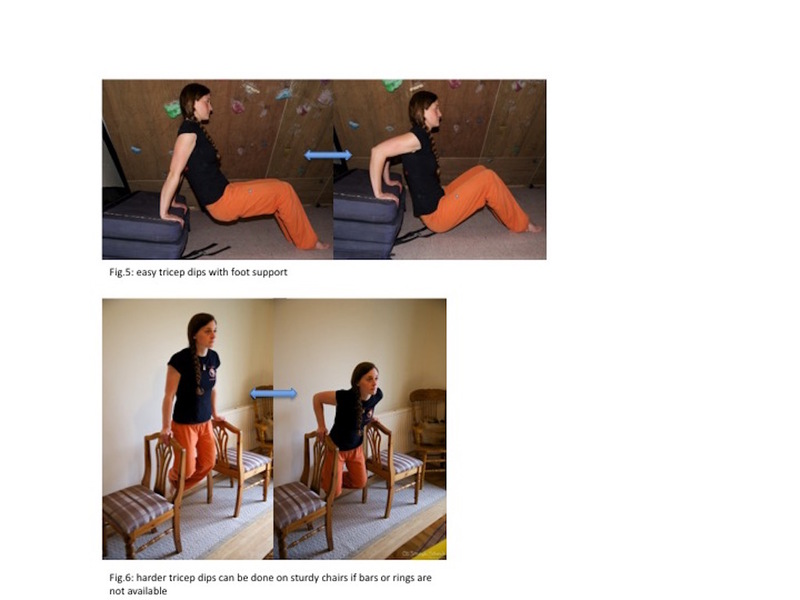 See my shoulder and elbow article on UKC for specific stretches. For those climbers who are already suffering, what can they do to get back to climbing safely? If you stop climbing as soon as you feel a niggle the rehab process wont stop you climbing for long. Powerfingers are great for rehabilitating elbow, wrist and finger injuries, if you rest from climbing for a few days and focus on your antagonistic work the pain should quickly subside. However, if you have already pushed it too far and the pain is fairly constant and severe you should stop climbing and see a good sports physiotherapist to get a diagnosis and to find out where your imbalances exactly are and to what severity. You also need to find out what stage of healing your tendon is in and how reactive it is. It will be different for everyone, so best not to do guesswork. Tendons like massage and heat because they don’t have a brilliant blood supply and that’s why they also need exercise to heal, but which ones exactly and to what extent, best to find out from a professional. You can use cold compress on sore tendons to calm them down if they got really injured by a forceful overload, e.g. : An obvious insult or strain, like working one strenuous problem over and over and then the next morning you woke up with pain in your tendon. You can ice 5 min 2-3x day until it calms down, but after that tendons like warmth, generally speaking. Ice can be used after rehab exercises as well, again just to calm down an overreaction. Never ice superficial (close to skin) tendon or ligaments longer than 5-8 minutes as you can damage nerve tissue and over cool tissue. Belinda Fuller is the Founding Director of her rock climbing company ‘Be Climbing’. Belinda is a performance coach, nutritionist and SPA instructor with a degree in Adventure Education and 9 years coaching experience indoors and out. As the head performance coach for the White Spider competition squad she is passionate about keeping her clients at the top of their game and most importantly injury free. Nina Leonfellner qualified as a physiotherapist from McGill University in Montreal, Canada in 1999. Nina has been treating sport and musculoskeletal injuries in the private sector since then.